I haven’t really done much sales shopping this year. OK, well I’ve done some, but it hasn’t all arrived yet so I can’t share my spoils with you. What I can share is my most recent buys from Everything Five Pounds, which is a veritable treasure trove of bargains all year round, not just in sale season. Starting with this absolute zingy beaut of a (faux) leather jacket. I know faux leather can be a minefield, often resembling shiny crap, but you’ll just have to trust me when I say this is super soft and squishy, looks really good quality, and is a beautiful colour which will brighten up milder winter days and work into spring and summer too. I think I was drawn to this dress because it reminds me of Christmas, which I realise is now a distant memory after a whole week back at work. I plan to wear it layered over a fine jersey polo neck jumper with ankle boots for office wear. 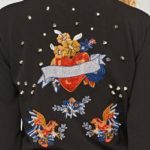 Love love LOVE this casual jersey jacket, which not only has some blingy stars on the front, but some rather dandy retro style embroidery on the back. Perfect for throwing on with jeans and a t-shirt for those inbetweeny days of spring, which can’t be too far away, can they? Talking of spring, how lovely and easy to wear is this pale blue boho blouse? 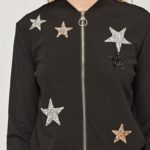 Perfect with leggings or ankle length skinny jeans, I’ll be chucking on loads of silver jewellery and some sandals with brightly painted toenails. Lastly a couple of shoe purchases, because shoes are my favourite wardrobe items of all. These 90s-esque platforms, which will be super stable thanks to the chunky heel and the buckled strap. And, again thinking towards spring, these fringed lace up open toe espadrille ankle boots. Anyway, because I had some Christmas money and each of these items only cost a fiver (clue’s in the name) it’s technically new stuff for FREE! And who can argue with that? Have you been buying any sales bargains, or anything at all? I’m hoping my deliveries will arrive imminently, and then I can pick what’s staying, what’s going, and share some more buys with you. I love love love this website, when I was a student it was a real life saver. Gutted that the gorgeous coral jacket has sold out in my size! The jacket was also available in fuschia pink, if that’s your colour? I keep telling myself that one expensive but versatile piece will be better than 10 cheap tops but it’s not working, quantity over quality all the time! I’m hoping they’ll add it in green or royal blue, been after a leather type jacket in one of those colours for ages. I’d love to see it too – a lot of it is still in black bin liners from when we moved! But we’re finally getting straight after our building work now, so I’ve started putting some of my faves on show; I have one bookcase full in the guest bedroom so far, with more to come. I’ll probably do a post about it at some point. Can’t wait! I want to use a bookcase too so they’re not hidden away. I’ve been in my place a year and still haven’t put everything in a place, it’s terrible! It’s so difficult to get straight and find a home for everything though! I’m not pregnant – it’s just how I’m standing! I'm not pregnant - it's just how I'm standing! – This, Tatt, and the Other on Athens. Not pretty, but pretty awesome!